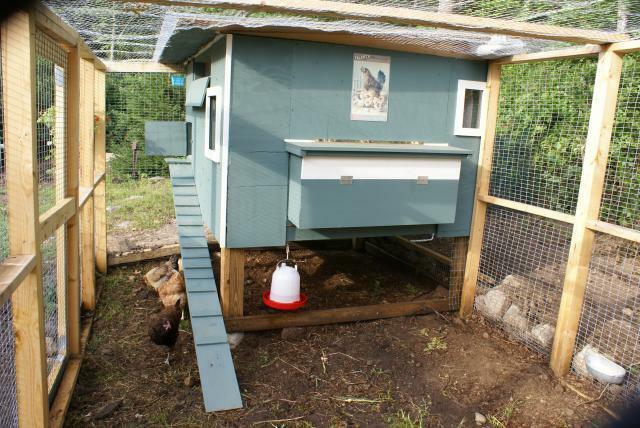 I decided on a 6 x 6 raised coop in a 9 x 18 run. Since I already had a 2 foot tall 6 x 6 base, all I had to do was build on top of that (after I built the fencing for the run). So, first I started the fencing. I made 13 6 x 3 panels using 2 x 4's and 1 x 2 welded wire. I used pressure treated wood on the bottom and sprayed the rest with a preservative for the weather. The coop and run are situated in my side yard at the edge of the woods. It gets morning sun and the trees/brush provide a nice windbreak and shade. The top of the run is covered with chicken wire to keep out the hawks. 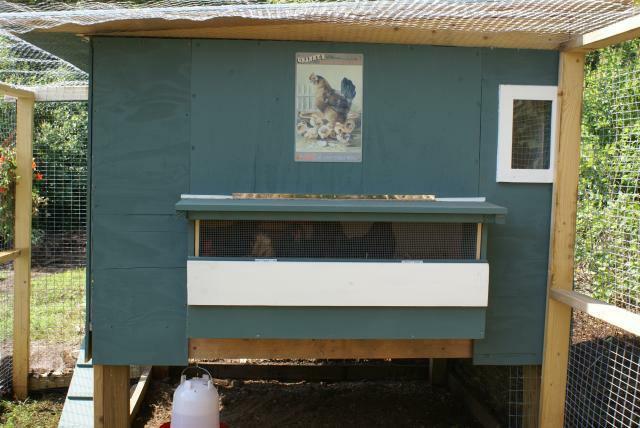 There's a 2 x 4 outside perch that runs across the width so the girls can get up higher if they want. 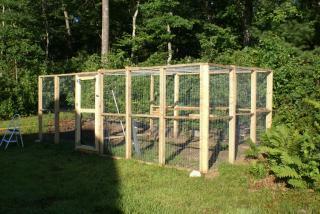 Then I began framing the sides of the coop. I did this all on the fly, without any plans, using 2 x 4's. This shows 2 of the coop sides. Each side is 6 feet long by 40" high to make a 36 sq ft coop. 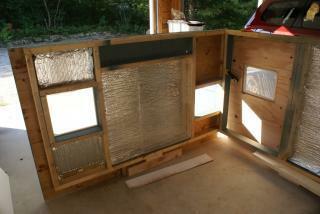 I used 1/2" exterior plywood on the outside and insulated the walls with foil insulation. On the left is the front with a window and the pop door. The window is covered on the inside with hardware cloth. On the outside I made a frame that I can put a piece of plexiglass in for the winter. That way I can still see in and there is natural light for the girls, but it won't be drafty or exposed. 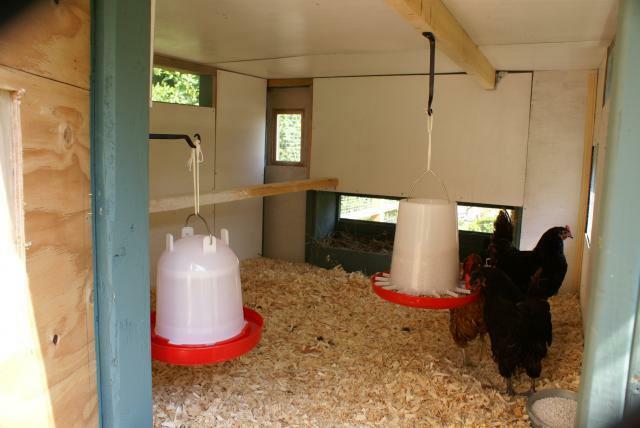 There is also a vent at the top center (there's another vent on the back of the coop also). On the right is the cleanout/access door, also with a window. The back is completely solid, except for the vent at the top. It faces the woods so I wanted to make it safe from possible predators. The front faces east and is pretty much sheltered from the wind by the house. Here's a picture of the finished inside (from the main cleanout door) with a few of the chicks. You can see the vent on the back and the communal nest box with the drop down panel opened. There's also a small window in the back corner so I can check on the girls from there. I have a small battery operated light just inside the main door so that when I check on the girls at night I can see them better. There's also a window in the main door so I can check inside without opening it up during the day. I used plant hangers to hang food and water inside so the girls have it if I'm late letting them out in the morning. They also have food and water outside. I have to admit, I'm pretty proud of myself. I'm a 54 year old woman with a bad back and arthritic knees and the only help I needed was to mount the sides on the base, lift the roof panels up and put a wire apron and rocks around the run. The rest I planned and executed all by myself. I'm pretty pleased with my nest box. The lid is hinged to stay up while I'm gathering eggs and there's a lip on the lid to help keep drafts out. I also put a hinged section backed with hardware cloth, that I can drop down for extra ventilation in the summer (it also allows me to see if anyone is on the nest without opening the top). You can see on the left it's open (see the chickie-girls peeking out) and on the right it's closed. Although the nest box side faces north, there are trees for windbreaks and I have plastic panels that I can put up on the run on that side for extra wind protection if necessary. The picture on the right also shows the pop door and ramp, and the closable vent at the top. The roof is pitched for rain and snow and is 1/2" exterior plywood (2 4 x 8 sheets) covered with a clear plastic roofing material (Suntuf). The roof is insulated with fiberglass insulation. I have the roof overhanging about 1 foot all the way around to add a little more protection from the elements (mostly for me when collecting eggs or checking on the girls). The girls have plenty of room under the coop to get out of any weather too. 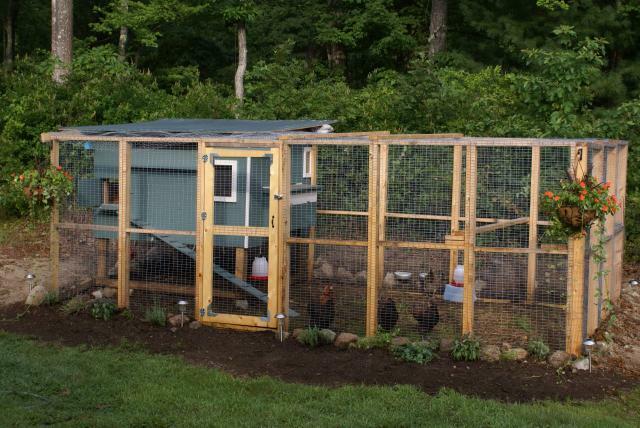 This is the finished coop and run. We put an apron all around the run, with rocks, to deter night predators. I added plants, mostly herbs, around the edges and some solar lights. This lovely...you did a fantastic job! Very pleasant set up and you should be proud!